Before the Civil War, American writers such as Catharine Maria Sedgwick and Harriet Beecher Stowe had established authorship as a respectable profession for women. But though they had written some of the most popular and influential novels of the century, they accepted the taboo against female writers, regarding themselves as educators and businesswomen. 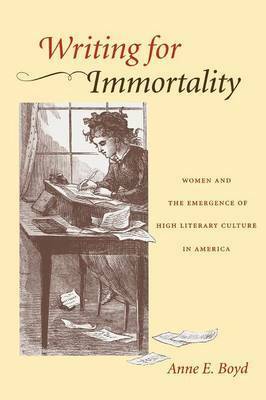 During and after the Civil War, some women writers began to challenge this view, seeing themselves as artists writing for themselves and for posterity. Writing for Immortality studies the lives and works of four prominent members of the first generation of American women who strived for recognition as serious literary artists: Louisa May Alcott, Elizabeth Stuart Phelps, Elizabeth Stoddard, and Constance Fenimore Woolson. Combining literary criticism and cultural history, Anne E. Boyd examines how these authors negotiated the masculine connotation of "artist," imagining a space for themselves in the literary pantheon. Redrawing the boundaries between male and female literary spheres, and between American and British literary traditions, Boyd shows how these writers rejected the didacticism of the previous generation of women writers and instead drew their inspiration from the most prominent "literary" writers of their day: Emerson, James, Barrett Browning, and Eliot. Placing the works and experiences of Alcott, Phelps, Stoddard, and Woolson within contemporary discussions about "genius" and the "American artist," Boyd reaches a sobering conclusion. Although these women were encouraged by the democratic ideals implicit in such concepts, they were equally discouraged by lingering prejudices about their applicability to women. Anne E. Boyd is an associate professor of English and women's studies at the University of New Orleans and editor of Wielding the Pen: Writings on Authorship by American Women of the Nineteenth Century, also published by Johns Hopkins.